Norman Osborn had nothing but good intentions (well, as 'good' as Norman can have) for Carol Danvers when he asked her to join his team of Avengers. But Carol flat-out refused to join and resigned from the Avengers. 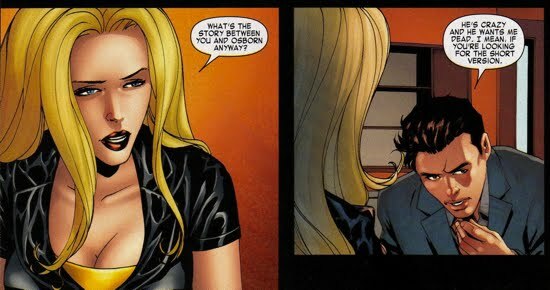 She was even more distraught to learn that her former allies, The Sentry and Ares, had willingly joined Osborn's campaign. After Danvers had rejected his offer, Norman knew that he had to kill her because she was too much of a threat to his operation. Since Norman had access to all government databases via the various government agencies, he eventually stumbled upon a CIA project known as Ascension. This was an unfinished project aimed at giving normal human beings super-powers. The problem was that this formula was not fully worked out and there was 78% mortality rate and the remaining 'recipients' experienced psychotic breakdowns. There was only a small chance that the Ascension formula would actually grant super powers. But that did not stop Osborn, he knew that in order to kill Danvers he would have to use someone with a similar power set, moreover, the person would need a reason to want to kill her. Enter Ghazi Rashid, a known terrorist and enemy of Ms. Marvel. Danvers and Rashid shared a violent past, she had killed all his men and had nearly killed him. Osborn was able to detain Rashid and provide him with the Ascension formula on one condition, he must kill Carol Danvers. Ghazi accepted. While Osborn was gearing up to kill her, Danvers was doing some investigating on her own. With a little help from Spider-Man, Danvers was able to break into a secured government facility where she found a crate that housed the Essential. In short, the Essential is a immortal little girl that feeds on information, she had been locked up since she was found in the late fifties. The Essential provided Danvers with an immense amount of information on Osborn, which included all of his illegal dealings over the years. The problem was, of course, decoding the completely illogical organization of the information she was given (the Essential's storing process was a bit random). Toward that end, Danvers teamed up with former CIA colleague Michael Rossi and the mercenary Rick Mason (son of the Terrible Tinkerer aka Phineas Mason). The trio was able to deduce Norman's involvement with the Ascension project and they set out to stop him. They tracked Rashid to Hong Kong where they attempted to subdue the terrorist. But Osborn remained one step ahead of Danvers and her cohorts, he had engineered the meeting between Rashid and Danvers. When Danvers confronted Rashid, her powers suddenly returned however, she found that she could not control them. The energy that her body absorbs from the world around her began to overcharge her, the swell of energy began pouring from her body. Convinced she was dying, she decided to take Rashid with her, however after blasting him with an intense energy projection he still did not die. 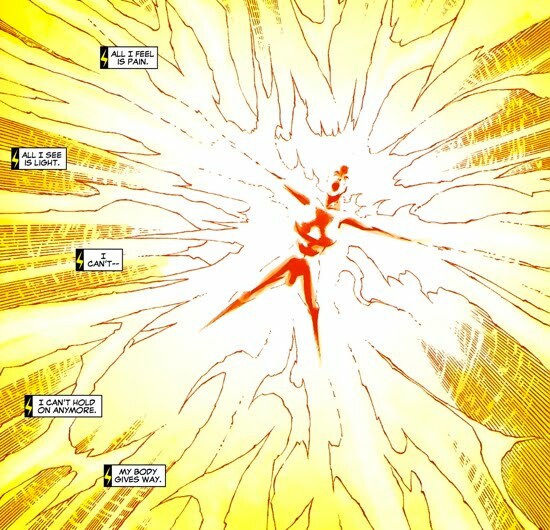 The Ascension had kept him alive, but Danvers was not so lucky, her body disintegrated in a fiery blast as her powers got completely out of control. Matters got worse for Danvers though, as Mason watched his ally explode above the streets of Hong Kong he went looking for Rossi. But Rossi had double-crossed the team and had been working for Osborn all along. Rossi left a trap (in the form of a bomb) for Mason and the latter was seemingly killed in an explosion. Three days later in Rio de Janeiro, Rossi contacted Osborn so that he could collect the money he was owed for arranging the Danvers/Rashid meeting that led to her death. But Osborn double-crossed the double-crosser, providing Mason (who survived the explosion using some Tinkerer tech) the location of Rossi so that he could kill him as revenge for betraying Danvers. 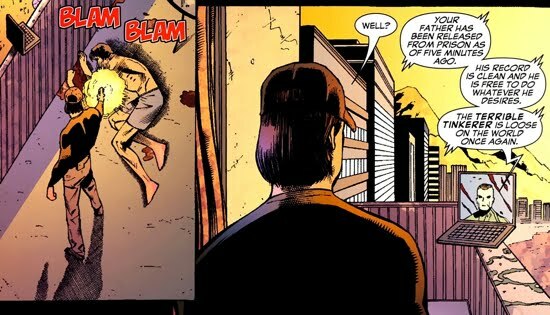 Mason kills Rossi and in exchange for tidying up Norman's loose ends, Osborn frees Mason's father from H.A.M.M.E.R. custody. After confirming his father's freedom, Mason vows to kill Osborn for his attack on Danvers. 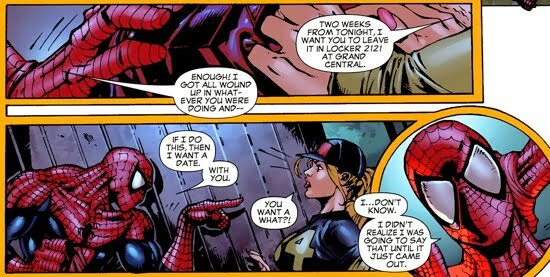 When Spider-Man helped Danvers breach the security of the government facility that housed the Essential, he did so in exchange for a date. Danvers tentatively accepted. Eventually they did go out on that date, and what did they discuss while out? Well, Norman Osborn of course...how nice!